Photo courtesy New York State Police. The New York State Police have issued a “missing vulnerable adult alert” for Beverly B. Cleveland, 92, from Brooktondale. She was last seen Sunday afternoon driving east on Slaterville Road, east of Ithaca, and then on I-81 in Binghamton. The 92-year-old white woman “may appear confused and disoriented,” according to the alert. “She uses oxygen and may be in need of medical attention.” She is five feet tall and weighs 115 pounds, with blue eyes and grey hair. 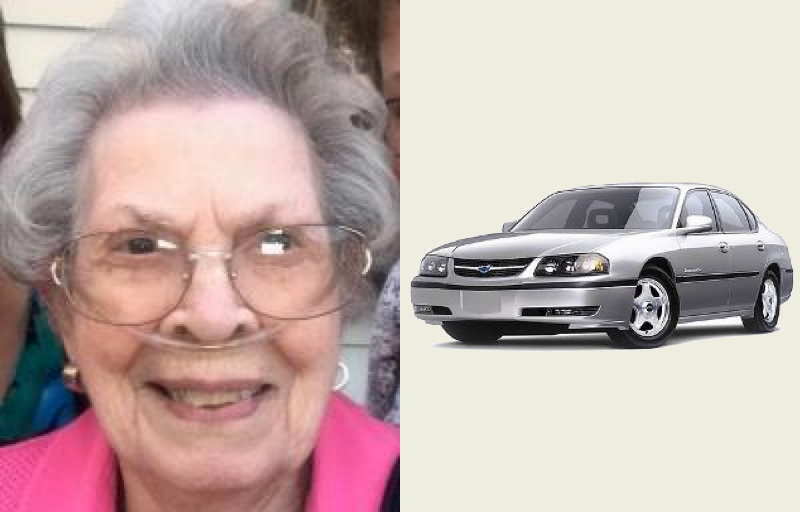 She was last seen driving a grey 2000 Chevrolet Impala, license plate FYR1831, similar to the car pictured, traveling east on Slaterville Road in the Town of Caroline at about 4pm on Sunday and then traveling south on I-81 near Front Street in the City of Binghamton at about 5pm on Sunday. She was wearing a decorative scarf, slacks, and a dark colored coat. Anyone who sees her is asked to call New York State Police at 607-561-7400 or 911. Story originally from 14850.com: State Police issue alert for missing Brooktondale woman.